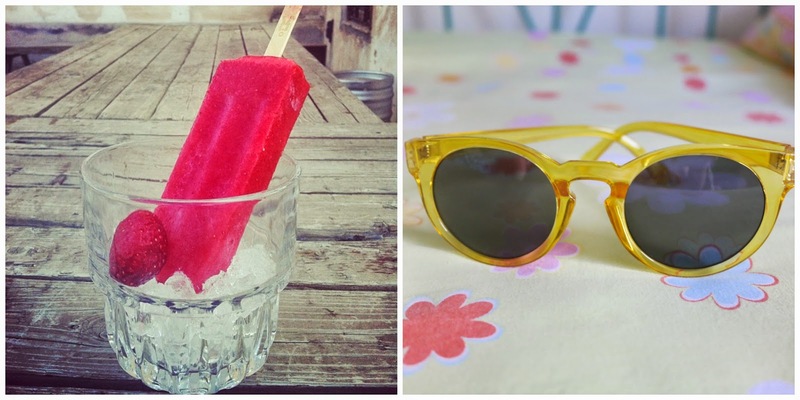 This week I'm channeling all kinds of summery vibes and I hope one of those will get you too!! EAT : I'm going to introduce to you something new and completely groundbreaking - okay I didn't discover gravity, but this is quite exciting too! It's called Papoto and you can find it exclusively at Bios - read more about it here! Basically it's a cocktail in a popsicle form, made with fresh fruits and a bit of booze!! I had my first experience with it last Thursday at the Papoto Craze Night Party at Bios, where they gave out little mini versions of it and the people declared the best flavour of them all - watermelon!! SHOP : I spoke about summery vibes and other than swimsuits, there isn't anything more summery than sunglasses!! I have created a little collection over the years and I can't help but making it bigger and bigger! So this summer I went for colour and chose this pair of sunglasses from Pink Woman. The lense has a little bit of a blue going on and they just seem so funky and laid back! !